November 21, 2009 saw an important new employment law go into effect. 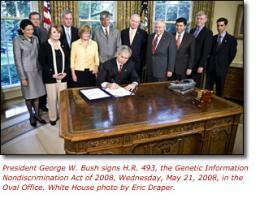 Commonly referred to as GINA, the Genetic Information Nondiscrimination Act was signed into law on May 21, 2008, after 10 years of attempting to pass the law. GINA is designed to prevent two main problems. The first problem involves the use of a person’s genetic information by insurance companies to deny health care coverage or determine how much coverage will cost. Second, and relevant for employment law purposes, GINA prohibits certain employers from discriminating against individuals based on genetic tests and information. GINA’s provisions apply to employers covered by Title VII of the 1964 Civil Rights Act and are similar to many provisions of Title VII. For example, employees must file a charge with the Equal Employment Opportunity Commission (EEOC) before filing a discrimination lawsuit. Additionally, GINA provides for the right to a jury trial, compensatory and punitive damages patterned after Title VII, and recovery of attorney fees for prevailing plaintiffs under the general fee-shifting statute applicable to federal civil rights act claims However, GINA does not create a disparate impact cause of action for genetic discrimination. (6) where an employer that conducts DNA analysis for law enforcement purposes requires genetic information of its employees, apprentices, or trainees for quality control purposes to detect sample contamination. Employers are required to update all posting in the workplace to reflect the new law. If you are interested in this new development, or have concerns about what GINA’s provisions, I have included a GINA table in the Box from the Genetics and Public Policy Center. You can also listen to an audiocast about GINA on NPR by following this link. This entry was posted in civil rights, employment discrimination and tagged 1964 Civil Rights Act, Civil and political rights, Equal Employment Opportunity Commission, Family and Medical Leave Act of 1993, Genetic Information Nondiscrimination Act, GINA, Labor and Employment Law, Law. Bookmark the permalink.